It became a yardstick of sorts. Did you possess the right mixture of fanaticism, masochism, and sheer love of the theater of the absurd to make it all the way through to the end? We talked about it for days afterward. I myself was a proud completist– I found only one other friend who could make the same claim. I stayed home that night to watch another 1985 Dwight Gooden start. And really, given the choice between fireworks and 1985 Doc, I’d make the same call every time. Well, Doc didn’t last long– he was pulled after a rain delay in the 3rd inning. But along with the rough Georgia weather, we got a 6:10, 16-13, 19-inning glorious mess of a game. The Mets racked up 28 hits, and the Braves bounced back to tie the game in both the 13th and 18th innings, the latter on a preposterous home run by pitcher Rick Camp. It was the only career homer for the .074 lifetime hitter. Tom Gorman was both the hero and the goat that night. He did yeoman’s work out of the bullpen, going 6 innings and ultimately picking up the win. But he also let up a game-tying home run to Rick Bleeping Camp. 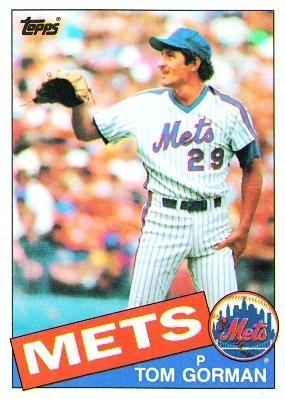 So Mets’ fans of a certain age, where were you on July 4th (and 5th) of 1985? I remember exactly where I was. I watched this game at my friend Bubba’s house, along with another buddy Jim. They were guys I usually played poker with but we didn’t have enough for a game that night. Bubba was a Braves fan, Jim sort of was, too. We didn’t see the entire game, but we probably saw 95 percent of it. I remember the Rick Camp HR more than anything else. I had completely forgotten that Hernandez hit for the cycle until I read it somewhere else recently.